Baozi the Pembroke Welsh Corgi at 5 years old—"Baozi is a very lovely, obedient, high energy dog that gets along with children." 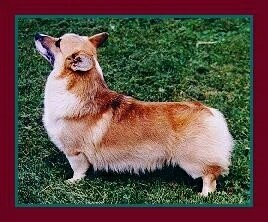 The Pembroke Welsh Corgi is a long (by its body compared to the legs), low to the ground dog. Its back is actually not longer than those of most dogs’; their legs are just very short in comparison. The skull is wide and flat between the ears. The stop is moderate. The topline is level. The nose is black and the jaw meets in a scissors bite. The oval eyes are shades of brown depending on the dog’s coat color. The eye rims are black. The erect ears are medium in size, tapering slightly to a rounded point. The legs are very short. The feet are oval in shape. Dewclaws are usually removed. The dog is sometimes born with no tail, and is docked as short as possible when it does have a tail. Note: it is illegal to dock tails in most parts of Europe. The double coat has a short, thick, weather resistant undercoat with a longer, coarser outer coat. 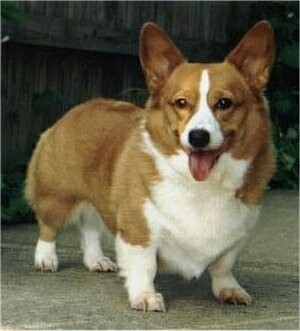 Some Corgis are born with longer coats called the "fluffy Corgi" or "longhaired Corgi." These dogs do not make the written standard and cannot be shown. Coat colors include red, sable, fawn, black and tan with white markings. There are often white markings on the legs, chest, neck and parts of the muzzle. 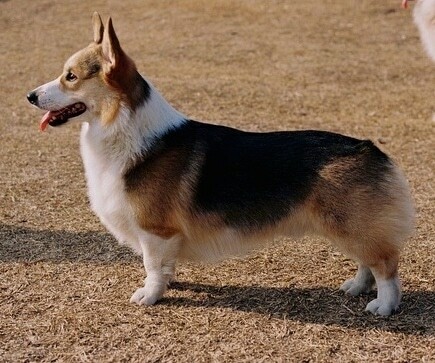 Some differences between the Pembroke Welsh Corgi and the Cardigan Welsh Corgi is that the Pembroke's tail is often bobbed or cropped at birth. Cropping tails is illegal in a lot of countries, and even in countries where it is legal, a lot of people opt out of cutting of the tail leaving it natually long. Whereas the Cardigan natually has a long tail and cropping the tail is not accepted in the written standard. The Pembroke usually has straighter legs as it is not quite as long-bodied as a Cardigan; the Pembroke's head is generally more wedge-shaped; the ears are smaller and closer together than the Cardigan’s; also the Pembroke tends to be lighter than the Cardigan. 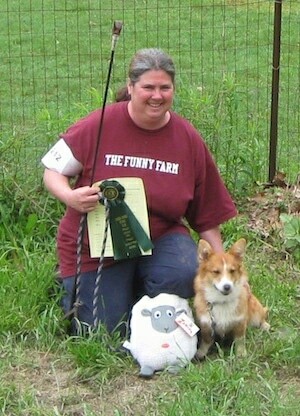 The Pembroke Welsh Corgi is highly intelligent, loyal, able and willing to please its owner. 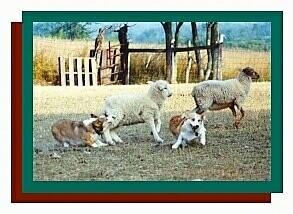 Corgis are extremely active and are good with children so long as the dog sees humans as above him in the pack order. Protective and sturdy, they make fine guards, and excellent show and obedience dogs. Wary of strangers, it should be properly socialized and trained when it is still young. They need their humans to have a determined, consistent loving approach, showing firm but calm leadership with proper human to canine communication to avoid over-protective behaviors as an adult. They sometimes try to herd people by nipping at their heels, although they can and should be trained not to do this. The Pembroke tends to bark a lot and makes a good watchdog. 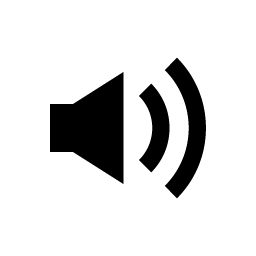 If you find your dog is barking at you in order to communicate, you need to hush the dog and look into your leadership skills. A dog that is barking at you in that manner is showing signs of dominancy issues. The human handlers need to communicate to the dog that aggressiveness with other dogs is an unwanted behavior. Usually good with non-canine animals. Do not allow the Corgi to developed Small Dog Syndrome. Prone to PRA, glaucoma and back disorders. Gains weight easily. Do not overfeed for if they become fat it can cause back problems. 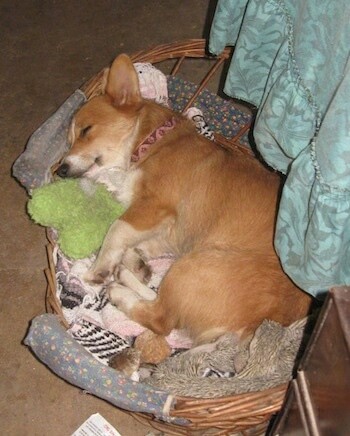 Corgis will do fine in an apartment if they are sufficiently exercised. With enough exercise they can be calm indoors, but will be very active if they are lacking. Will do okay without a yard so long as they are taken for daily walks. Naturally active little dogs, they should always be encouraged to remain so. They need to be taken on a daily, long walk. While out on the walk the dog must be made to heel beside or behind the person holding the lead, as in a dog's mind the leader leads the way, and that leader needs to be the human. The soft, medium-length, water-resistant coat is easy to groom. Comb and brush with a firm bristle brush, and bathe only when necessary. The coat is shed twice a year. The Cardigan Welsh Corgi is older than the Pembroke Welsh Corgi, with the Pembroke being bred out of the Cardigan. Both Corgi varieties may be a descendant of the Keeshond, Pomeranian, Schipperkes and the Swedish Vallhund. Some say the older Cardigan was from Cardiganshire brought there by the Celts in 1200 BC. Whereas, the Pembroke's ancestors were introduced by Flemish weavers to the Celts in the 1100s. 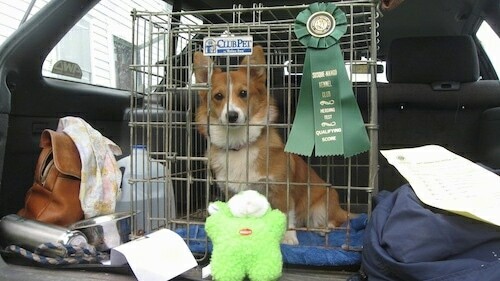 Whatever the case may be, the Cardigan and the Pembroke Welsh Corgis were interbred and considered the same breed up until 1934, when a show judge thought they were too different and separated them into two different breeds. After they were separated the Pembroke gained in popularity and is to this day more popular than the Cardigan. The name "corgi" is specific to that type of dog breed in Cymreig (Welsh). 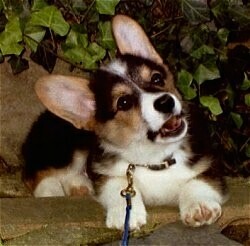 “Dog” in Cymreig (Welsh) is 'Ci' or if it is softly mutated 'Gi,' hence Corgi. The Pembroke was actually recognized by the AKC a year before the Cardigan. The Cardigan was recognized in 1935 and the Pembroke in 1934. 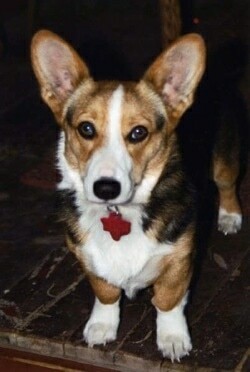 Corgis were used as cattle drivers, vermin hunters and farm guards. They drove cattle by barking and nipping at the cattle's heels rather than just herding them. The dog's low stature helped him roll out of the way of kicking cows. This is Chip, a tricolor Pembroke Welsh Corgi puppy. 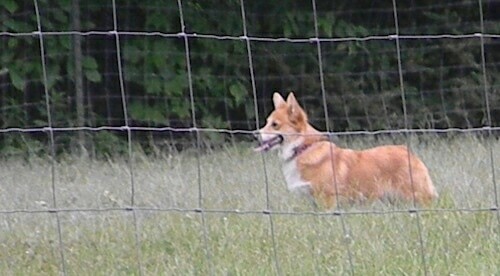 "Abby is our Pembroke Welsh Corgi shown here at a year old. She is so sweet and gentle, and good with the grandkids. 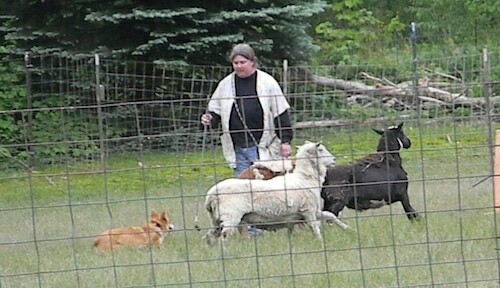 She likes to nip at their heels and tries to keep them herded in part of the yard. Her father's name is Cowboy Giz and mother is Katy Get Ur Gun." 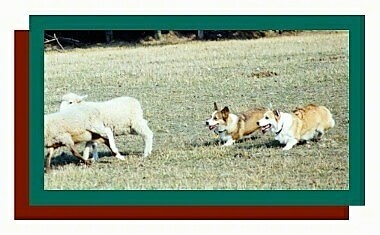 Clarabel is proudly shown here winning her first herding title at just 9 months old.